CRSC Property Sdn Bhd plans to launch The Parc high-end office suites in Rampai Business Park in Kuala Lumpur in the next few months. Located on 3.84 acres in Setapak Jaya, The Parc comprises two blocks of seven storey buildings with 161 strata-titled offices worth an estimated gross development value (GDV) of RM100mil. The built-up of the office suites is between 1,500 sq ft and 3,000 sq ft and priced from RM300 per sq ft. It is targeted at young professionals including engineers, accountants, lawyers and quantity surveyors. “A unique feature of the project is that every unit has its own private lift and exclusive access to the office from the basement car park,” senior project director Chia Kim Puin said in an interview with Starbiz. The Parc also boasts of scenic park and lake views. Chia said The Parc has a wide range of facilities including food and beverage outlets, a gymnasium and spa. It will also be equipped with wifi and broadband facilities as well as guards and closed circuit televisions on all public areas and lift lobbies. On CRSC's new projects, Chia said the company would focus on phase four of Rampai Business Park project, which was a joint venture with Kuala Lumpur City Hall. Comprising 100 terrace factories and 400 medium-cost apartments, it has an estimated GDV of RM100mil. CRSC was the project manager for phase three of Rampai Business Park, a joint venture between Pancaran Nilai (M) Sdn Bhd and DBKL. Chia said CRSC would also partner with DBKL for a 90-acre mixed development, Jinjang Tambahan in the north of Kuala Lumpur that has an estimated GDV of RM1.5bil. The project would keep the company busy over the next eight to 10 years. Currently, the ratio of the company's projects between mixed development, commercial and industrial projects is 40:30:30. Of its total landbank of 300 acres, 100 acres are in Kuala Lumpur. In another joint venture, CRSC is partnering with Aman Resorts International to develop the six-star Belum Island Resort in Perak. Phase One of the 5,000 acre project will cost RM50mil. The first phase of the development will kick off in the first quarter next year. The entire project will be completed in 20 years over four phases. Phase One comprises 20 to 30 floating bungalow units on Tasik Temenggor. The proposed room rate for each bungalow will be at US$1,000 a night. Meanwhile, CRSC plantation unit, Citarasa Murni Sdn Bhd has embarked on the Lancang Agriculture Project to cultivate organic fruits and vegetables. Khazanah Holdings Bhd's subsidiary Malaysian Agrifood Corp Bhd will market the produce on a contractual basis for both the local and export markets. “This venture will contribute about 20% to the group’s revenue in the next 10 years,” he said. CRSC posted RM50mil in revenue for the financial year ended Dec 31, 2007. UEM Land Bhd will acquire about 40ha from Setia Haruman Sdn Bhd, the master developer of Cyberjaya, and launch its first housing project in the digital city worth some RM1 billion by year-end. It is learnt that UEM Land- a unit of UEM World Bhd, Malaysia's third biggest construction concern - will buy the land for less than RM150 million to construct over 3,000 units of superlink, semi-detached houses and condominiums. A company source told Business Times that UEM Land plans to sell the houses from RM500,000 each, and condominiums starting from RM200,000 per unit. "Both firms are finalising the land deal. It is Setia Haruman's objective to equip Cyberjaya with 6,200 homes by 2010," the source said. Cyberjaya, Malaysia's IT hub, has 2,700 houses comprising landed properties and apartments. The homes were built by Setia Haruman, Country Heights Holdings Bhd, MK Land Holdings Bhd and Emkay Group of Companies. The source said by 2010, UEM Land will add 1,000 homes in Cyberjaya and another 1,000 units will come from Cyberview Sdn Bhd, one of four key stakeholders of Cyberjaya besides Setia Haruman, Multimedia Development Corp and Sepang Municipal Council. Cyberview will launch myHome@Cyberjaya, its first housing project, by August. The other players in the intelligent city now are Emkay Group and Country Heights, building over 500 apartments collectively. Emkay Group and UEM Land, which hold 75 per cent and 25 per cent of Setia Haruman respectively, are buying land in the company to jump-start land purchase by other developers, said the source. Emkay Group had previously bought land from Setia Haruman to develop an IT park, dubbed MKN Embassy TechZone, corporate buildings and affordable housing. How can you tell when the property market is softening? There are several telltale signs like developers taking a longer time to sell their properties, delaying new launches and giving away more freebies and incentives. A weakening market will also see a decrease in rental and capital values. There are also more subtle signs like the developer keeping a low profile, the project slowing down, the development changing hands or the developer maintaining the original selling price but reducing the built-up area. There are also instances where the developer continues to build the houses despite very slow sales but this situation is masked as “build then sell”. Some developers might earlier claim they have sold most of their units but later said they have taken back the units and selling en bloc as prices have escalated. These ominous “signs” have mostly surfaced. Of late the property development industry is feeling the jitters as crude oil prices continue to soar. The industry is grappling with increased cost of doing business, rising price of building materials, inflationary trends in cost of living, global economic uncertainties, rigid policies for developers and a softening market. Property developers are also faced with eroded profit margins, higher construction costs, intense competition, and fear that rising inflation was affecting buyers' sentiment and affordability. To make things worse, they are burdened with what Real Estate and Housing Developers' Association (Rehda) president Datuk Ng Seing Liong described as “onerous contributions and social obligations”. Although he did not elaborate when speaking at the official opening of Mapex 2008 in Kuala Lumpur last week, it is clear what he meant: developers having to provide all sorts of amenities from building police stations, community halls to flyovers. Many developers have argued that even in the best of times, these “social obligations” were “eating” into their profits, what more in the current tough market condition. The Government has proposed various measures in the 2008 Budget to sustain economic growth and provide such incentives as 50% waiver of stamp duty for purchase of one house costing not more than RM250,000 from Sept 8, 2007 until Dec 31, 2010; exemption of real property gains tax; allowing monthly withdrawal of EPF contributions for housing purposes and a RM50mil fund to guarantee housing loans for buyers who do not have fixed income. However, Rehda feels this is not enough and wants policy changes. A “thorn” in their flesh is the bumiputra quota in which Rehda wants the release procedures to be standardised to reflect a more transparent and structured release mechanism. “Bumiputra quota should not exceed 30%, based on sales regardless of the units being sold to bumiputras were the identified lots or not. Bumiputra discount should be capped at 5% and only applicable for houses priced at RM250,000 and below, excluding low-cost and low-medium cost houses,” said Ng. Ng said it was unfair for someone who could afford a multi-million ringgit property to enjoy a bumiputra discount that differed from state to state (7% discount for Selangor, 15% for Johor and 10% for other states). Rehda, he said, also wanted the Government to take over the provision of low-cost public housing, thus freeing the private sector developers to focus more on market driven products. The Government should also review the price of low-cost housing from the current RM42,000 to RM60,000 to mitigate increased costs. Rehda hopes the Government would abolish its decision to charge 10% import duty on cement importers immediately. “Instead we hope the Government will impose 10% to 20% export duty on all cement and steel materials to ensure adequate supply,” he added. Rehda vice-president Datuk FD Iskandar said it was inevitable that house prices would go up soon as construction costs had shot up by 30%. “Prices of raw materials from steel to cement have all gone up. It will be very challenging for the property development industry. Contractors are crying out for a revision of their contract prices and they will walk off if their demands are not met. Projects will stall,” he said, adding there was also a shortage of steel and cement whose prices have risen to RM4,000 per ton and RM18 per bag respectively. Iskandar who is also the Rehda Selangor chairman said there were construction firms who would be too glad to get out of a contract now that prices of everything had soared. They would stand to lose, as there was no price fluctuation clause to allow for an upward revision of prices. “Some of them prefer to wait until prices have stabilised,” he said. Unless oil prices drop drastically (which many industry players do not see it likely to happen) and the inflationary trend is checked, the economy in particular the housing and construction industry will be heading for a downturn. BEN Rautin Sdn Bhd, a global trading firm is set to strengthen its foothold in China, eyeing for projects in the petrochemical, residential and tourism-related industries, with a combined projected investment of US$7 billion (RM22.75 billion) in Beihai City. Its founder and managing director Ismail Rautin Ibrahim said the company has been approached by the Beihai City Foreign Investment Services Bureau to spearhead the development of the three potential industries in the city, which is located in the Guangxi province. "The bureau sent an invitation letter to me on May 9, seeking the company's 30 years experience in China to participate in the development of the three industries in Beihai. "They want the group to spearhead a group of international and local companies to help develop the three industries in the city," he told Business Times in Kuala Lumpur. Ismail said he went on May 12 to explore the potential areas for the mammoth projects in Beihai, the second largest city in Guangxi after Nanning. "It was originally intended to be an exploratory and investigative mission to seek the potential of the projects but it turned out to be a confirmed participation on our part. "Both the group and the bureau are currently drafting a memorandum of understanding (MoU) to develop the areas into a petrochemical hub, mini city and tourism destination in Beihai. "We hope to sign the MoU by July before the starting of the Olympics Games slated for August," he said. Ismail said Ben Rautin could not tackle all the projects by itself, and is looking for partners to develop the petrochemical, residential and tourism areas in Beihai. He indicated that the company may tie up with a Qatar company for the petrochemical portion, and with a Taiwanese property developer for the residential area. Ben Rautin entered China's market in 1977, initially for trading activities. Its earlier major project included the construction of residential and commercial properties in Guizhou province in 1990s. On the company's other projects in China, Ismail said they are still progressing but need time to settle various issues, including land matters. It was reported that Ben Rautin has a working interest in the development of a petrochemical complex and port projects in Lufeng City. The initial cost of these projects in Lufeng City amounted to about US$7 billion. Ben Rautin was also offered a stake to participate in the US$6.1 billion (RM19.83 billion) hydropower project along the Amoijiang river in southern China. Singapore-based Penstone Power Ltd, one of the three companies that secured the hydropower deal, has invited Ben Rautin to participate in the project. MIAMI: Property values in U.S. cities are expected to tumble by US$1.46 trillion in 2008 due to the housing downturn and subprime mortgage crisis that has pushed the U.S. economy to the brink of recession. Cities, where some 85% of the 300 million Americans live, face weak economic growth and tepid job markets from the housing crisis and rising fuel and food prices, according to the study by private analysts Global Insight for the U.S. Conference of Mayors meeting in Miami last Friday. Just eight months ago, researchers predicted property values would shrink by US$1.2 trillion this year, the study said. "Metro areas are expected to suffer a US$1.46 trillion decline in property values in 2008," the study said. "The increased loss is a result of even greater deterioration in home markets and prices than anticipated." The decline is the equivalent of US$21,277 per home, the study said. A view of the curved titanium roofing from the front. The common corridor on the first floor runs across the entire length of the house behind the louvred windows. IT takes a lot of courage to do the unprecedented. While it is natural for any land owner to want to build himself a dream home, of whatever shape, style or size it may be, it takes another to put so much emphasis on the roof, which was what this particular owner did. Holidaying in Barcelona, Spain three years ago, he came across houses with titanium roofs. He was intrigued. “Titanium is a metal. It has the strength of a space shuttle, depending on the thickness of it. It is durable. And when it rains, there is hardly any sound. It can last 50 years without maintenance and the wonderful part of it is that, it does not leak nor rust. “While these can be reasons why I opted for it, essentially, I wanted something different and something beautiful,” he says. He says the metal does not heat up the house as it comes with layers of insulating materials. Located in Country Heights Damansara, a new area straddling Kuala Lumpur and Petaling Jaya, with a Kuala Lumpur address, the two-storey house has a rather futuristic facade. The burnished sheen of the metal and the way it curves over the first floor gives the house a rather space-ship look. “It would be expensive to have it as one single sheet. So I had it done in pieces. The fact that it is curved makes it more difficult to do. An installation team from Singapore was despatched over and special machines brought in from Germany,” says the owner who says this is the only house in the country to have a titanium roof. 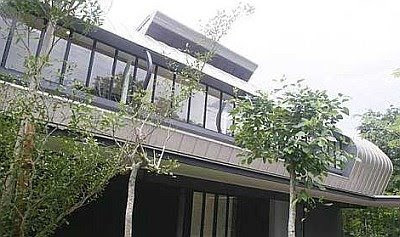 The house is designed by a Singapore architect (www,lookarchitects.com.sg). The rest of the house, the front and back and sides, are glass with timber cladding. Hardwood balau is used for the external cladding and deck while merbau is used internally. While the external focal point of the house is the roof, the internal emphasis is the view. Because the house is located on one of the three peaks that form Country Heights Damansara, the owner has designed the house to emphasise the Bukit Lanjan forest reserve. Hence, the use of glass sliding doors throughout the entire length of the house on the ground floor and on the first floor. All the four rooms upstairs are located on a long line sharing a common balcony on one side and a long common area on the opposite side. A view of the pool and Bukit Lanjan forest reserve from the guest room. Notice the glass and timber cladding of on the right which form the wall of the house. The balcony overlooks the forest reserve. A flight of merbau steps from the ground to the first floor separates the master bedroom from the rest of the three rooms, which come with attached bath rooms. A guest room downstairs also has its sliding doors opening out to the forest reserve and the swimming pool.